Since the structural transformation (1989-1992) authors still mention the same supreme principles, although a new constitution was resolved in 1997. It seems unlikely that coming into force of the constitution - which differs from the preceding constitutional regulations - has not caused at least minimal changes among constitutional rules of law. 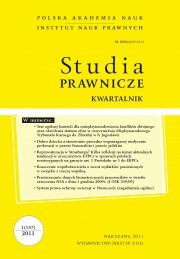 The paper focuses on considering if a rule stated in the 38th article of the Polish Constitution is a rule of law. The above regulation providing protection of life, introduced to the Polish legal system by the new constitution, has never been similarly analysed. Article 38 is not only a declaration but also has a practical meaning for proclaiming and applying the law. The regulation directs the Polish legal system at human protection. Ultimately, then, article 38 is a significant constitutional rule. According to the doctrine of constitutional law, such rules are defined as constitutional rules of law. The above rule should be reckoned among substantive rules as it is highly abstract and has a key meaning for the human protection provided by the constitution. This leads to the conclusion that article 38 is essential for determining main objects of the state's activities in terms of a life protection. To sum up, it plays an important role in the Polish legal system.